eReader1: New Kindle Fire HD, new sizes, new prices! 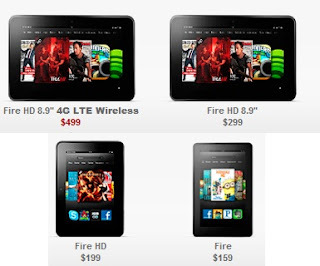 New Kindle Fire HD, new sizes, new prices! The Kindle Fire has a few new versions! 4G $49.99 per year - very good deal!! First off, the regular Kindle Fire 7 inch has dropped to $159. It is improved though, with faster performance and better battery. What's new with the others? HD options...larger screens... larger storage up to 64GB... faster WiFi... 4G option ($49.99 per year!!)... front facing camera... and more! And the WiFi beats the rest! Kindle Fire 7 inch 8 GB $159 - ships next week!